RIVERSIDE — The Riverside Community College District Board of Trustees and Chancellor Gregory Gray will recognize Trustee Mark Takano on Thursday, Dec. 6, at 4:30 p.m. at the Center for Social Justice and Civil Liberties, 3855 Market St. (near White Park), Riverside. 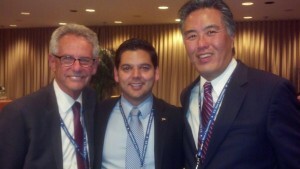 From right: Incoming Democratic members of Congress Mark Takano of Riverside, Dr. Raul Ruiz of Coachella, and Al Lowenthal of Long Beach. Takano, who was victorious on Nov. 6 in his third bid for Congress, was first elected to the RCCD Board in 1990 and served as president in multiple terms. He championed the School for the Arts and was an avid supporter of the Passport to College scholarship program, early and middle college high schools, and the Innovative Learning Center at Stokoe. He also served as vice chair and chair of the Inland Valley Trustees and CEO Association and on the board of California Community Colleges Trustees. Takano took part in the June opening of the RCCD’s Center for Social Justice and Civil Liberties, which was also a celebration of the centennial of artist Miné Okubo’s birth. Okubo, known for her book “Citizen 13660,” was a Riverside native and RCC graduate who bequeathed her artwork and writings to the college. The Takano and Okubo families were close, and like Okubo, the congressman-elect’s parents and grandparents were interned during World War II.